Eleanor Roosevelt knew of the Vatican’s involvement in genocide in the Balkans during World War II. FDR likewise expressed horror at the atrocities taking place in Yugoslavia perpetrated by the fascist clerical state of Croatia (NDH) most notably against the Orthodox Christian Serbian people, but also against the Roma and the Jews. And yet nothing was done to stop the murder of hundreds of thousands of Serbs in Balkans. The massive, grisly slaughter continued unabated. Ironically it was the Serbian people who defied Nazi Germany, revolted against the signing of the Tripartate Pact by the Serbian Regent, eventually holding up no less than 30 German tank divisions as a part of the guerilla Partisan fighters led by Tito. All the rest, the Bosnian Muslims, the Roman Catholic Croats, the Muslim Albanians-became allies of Nazi Germany. Aggressively incited by Roman Catholic and Muslim clergy, they enthusiastically aided the genocidal effort to round up and slaughter Jews, Serbs, and Roma: The Catholic Croats were responsible for some of the worst, most horrifying atrocities of Holocaust. Muslim Bosnians and Albanians each established Nazi SS divisions. Germany, though, would have its revenge when the United States–the Clinton White House–would help it win the war it had lost in the Balkans, destroying the Partisan nation of Yugoslavia that had successfully thwarted its imperialist ambitions in Eastern Europe. It was a crucial part of a much larger campaign that continues today. From left, Andrija Artukovic, the Interior Minister of the NDH, Vatican Legate Ramiro Marcone, and Zagreb Archbishop Alojzije Stepinac, at an Ustasha ceremony. 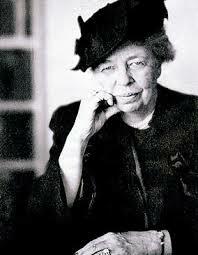 Eleanor Roosevelt had also learned of the mass murders and atrocities in the NDH in 1941-42. (21) The author Avro Manhattan met Eleanor Roosevelt at a private dinner party in Upper Brook Street, Mayfair, London in the late 1940s. At the time he was researching and writing his book on the Ustasha massacres in the NDH. In 1953, he published Terror Over Yugoslavia: The Threat to Europe, (London, UK: C.A. Watts, 1953). In 1986, he published The Vatican’s Holocaust: The sensational account of the most horrifying religious massacre of the 20th century (Springfield, MO: Ozark Books, 1986).